Denver, Pennsylvania, August 6, 2016 - Morphy Auctions, the finest auction destination for fresh to the market collections, is excited to announce this highly anticipated, early fall antique advertising sale event to be held on September 10th and 11th, 2016. Over 1,000 visually striking and carefully assembled lots will be on offer. All selections from this sale are on display in Morphy's auction gallery and available for preview now. This auction’s offering of over 30 lots of fine barbershop merchandise is truly cutting edge. It’s no fish tale to say that lot #1, a nicely detailed, “Limoges France” marked fisherman's occupational shaving mug, will get collectors all in a lather. This mug, with great detailing and the name “John Hager” in gold gilt across the top, is estimated at $300-500. And its certain to be an arms race over lot #3, a weapon dealer's shaving mug, estimated at $400-800. This item features the name “S. Mitchell” in gold gilt, and is detailed with the images two shotguns, a pistol, and a knife on the front. It’s happy hour any time of the day when it comes to this sale’s fine selection of alcohol related advertising materials. A trio of Anheuser Busch brand materials deserves a special toast. Lot #196, a beautiful, clean Anheuser Busch beer glass globe fixture with its original hanging brackets and electrical cord will light up the crowd and is estimated at $2,000-3,000. Lot #231, a pre-prohibition Anheuser-Busch Brewing Association litho transfer sign featuring the Statue of Liberty in the background is a real standout and is estimated at $4,000-8,000. And lot #234, an early, rare, pre-prohibition Anheuser-Busch reverse glass C. Conrad & Co. sign turns things around with its $2,500-4,000 estimate. For those collectors who desire the wheel-deal, lot #167, a beautiful, clean Marathon City Brewing Company Tannenbaum Beer reverse glass taxicab light sign will certainly earn its fare. This very rare example, manufactured by Gillco, is king of the road with its $3,000-5,000 estimate. This sale also offers a refreshing range of soft drink beverage advertising, with over 230 lots on offer. Sparking selections include lot #300, an extremely rare and vibrant cardboard Coca-Cola trifold window display from 1925, estimated at $4,000-8,000. This item was made by the US Printing and Litho Co. and has strong and unique graphics. And just how unusual is this sign? According to our expert catalogers, “We have never seen this before and it is not in any of the Petretti’s Coca-Cola books.” Also bubbling to the top in the soft drink category is lot #415, a Hires Root Beer punchbowl made by Villeroy & Boch, Germany which comes with a set of four Hires root beer "Ugly Kid" logo mugs in different styles. Together, these five items are estimated at $15,000-25,000. The punchbowl, which features multiple “Ugly Kid” logos, is incredibly rare and is seldom if ever seen on the secondary market. Morphy’s is recognized as the “go to” auction house for world-class antique advertising materials and ephemera, and the outstanding lots on offer in this sale further confirm this leadership position. Examples promoting food, consumer items, social organizations and movements, professional services, pharmaceuticals, tobacco items, and many other specialties take center stage. 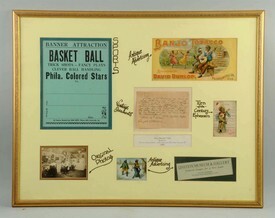 Lot #60, a framed collage of Black Americana ephemera including a basketball advertising flyer, a Banjo tobacco paper sign, a photo of an early black barber shop, and an early slave document, is a rich and important snapshot of history and is estimated at $400-800. Collectors will find themselves drawn to lot #55, an all-original framed John Deere lithograph advertising poster showing a deer pulling a John Deere carriage, estimated at $2,000-4,000. Keeping things on point, lot #639 - a c. 1900 Wyandotte Detergent tin litho advertising sign featuring a Native American aiming his bow and arrow - should have no trouble hitting its $2,500-5,000 target. And the heat is on lot #1094, a Doan’s diecut wooden advertising thermometer in working order, estimated at $200-400. This sale rounds out with an impressive selection of coin-op machines, including gambling, arcade, gaming, and vending examples. It’s a race to the finish with lot #69, an early two-wheel bicycle trade stimulator. This unusual example in all original finish has its original Modern Desk & Display Case Co. makers tag on its the cabinet and is estimated at $4,000-6,000. Image: Black American Ephemera Collection, estimate $400-800.